The poles of Mars host massive amounts of water ice in the form of polar caps, much like Earth’s Antarctica. In the north, a ~1.5 km-thick dome of nearly pure water ice makes up the so-called north polar layered deposits (NPLD), the second largest water ice reservoir on the planet. These icy deposits owe their name to their fine layering exposed along scarps and spiral troughs. Since their discovery, scientists considered the precious stratigraphic record of the NPLD as a Rosetta stone for deciphering recent climate changes at a global level, yet little is known about the initial polar cap growth. Past studies found links between the upper NPLD strata and variations in the orbital motions of Mars, an effect called “orbital forcing” which is especially intense due to wide oscillations of the spin axis obliquity. However, the lowermost strata of the NPLD are exposed only in a few places, making models of the initial ice growth hard to constrain. Fortunately, radar sounding can image through the whole thickness of the northern polar cap, revealing its entire internal stratigraphy. There are currently two sounding radars in orbit around Mars. This study uses data from the Shallow Radar (SHARAD), which has an excellent coverage of the NPLD with over 3000 2D profiles, of which about 700 were analyzed to reconstruct the first stages of water ice accumulation of the NPLD. Sounding radars like SHARAD send radio signals towards the surface, which are then reflected as echoes (usually referred to as reflectors) when significant changes in composition occur, such as alternating ice and dust layers. Radar data are represented as 2D profiles, where the vertical axis represents the time delay between surface and subsurface reflections detected by the instrument, and the horizontal axis represents the distance along ground track traveled by the spacecraft. In other words, SHARAD profiles are slices of Mars’ subsurface showing its internal layering and structures. SHARAD profiles allow delineating the stratigraphy of the lowermost ~500m thick sequence of the NPLD in 3 dimensions at the scale of single radar reflectors. In turn, this allows investigators to determine net ice accumulation and retreat phases via strata geometries and qualitatively compare those to available ice accumulation models based on orbital forcing. Out of eight mapped ice units, five exhibit only minor thickness, in agreement with previous studies that revealed a general thickness uniformity of NPLD layers. Conversely, three units exhibit significant thickness variations and reduced lateral extent compared to the other units. In particular, the oldest NPLD units consist of two disconnected deposits respectively located above an older dome-shaped deposit called “basal unit,” and the plains that also surround the NPLD. One unit consists of a quasi-circular dome shape with an average thickness of ~40m. The other unit is located in the Gemina Lingula region, and is also ~40 m thick and has a dome shape elongated in the E-W direction. Upward in the stratigraphy, SHARAD detects another unit which terminates with a wedge shape and doesn’t extend to the south as much as the units below and above it. Finally, towards the top of the sequence, the units show an undulating pattern roughly transversal to the length of Gemina Lingula. This study shows that the topography of the earliest NPLD evolved by gradual stacking of ice units, with alternating growth and shrinkage of the ice accumulation area. The thickness of the units also indicates that the major ice accumulation centers moved with time, rather than remaining fixed on the pole. Topography alone may have driven the formation of morphological anomalies in the lowermost NPLD by a variety of mechanisms. The stratigraphic evidence points to katabatic winds as the main responsible. Katabatic winds are cold, dense masses of air that flow from high elevations down a slope under the pull of gravity. The dome structure and slopes of the basal unit underneath the NPLD were likely sufficient to initiate katabatic wind flow prior to ice accumulation. In this scenario, ice accumulation is favored at the top of the dome, where the winds are slow, and in the low-lying areas adjacent to the slope break, where winds slow down after accelerating and removing ice along the slope. The study argues for a self-sustaining constructional process in which ice redistribution by katabatic winds maintained – and eventually increased – the original topographic relief of the basal unit, which in turn supported further katabatic flow. Katabatic winds cause undulations to form on the modern surface of the NPLD. This mechanism can also elegantly explain the undulations observed in some ice units in Gemina Lingula, further supporting the role of katabatic winds in shaping the lowermost NPLD. The shape and location of Gemina Lingula have often attracted interest among polar investigators because it constitutes an anomaly in ice deposition by extending to the south and making the polar cap asymmetrical with respect to the pole. SHARAD reflector mapping conclusively revealed that construction of the proto-Gemina Lingula began as an individual deposit already separated from the rest of the polar cap. Overall, the lowermost NPLD evolution revealed by SHARAD can be described as alternating retreat and expansion phases of water ice accumulation, which are likely related to repeated global climate change. Considering the findings of previous efforts in modeling NPLD growth based on orbital forcing, this study concludes that periods of high spin-axis obliquity caused a retreat of the ice accumulation area and, conversely, low obliquity favored widespread ice sheet growth. 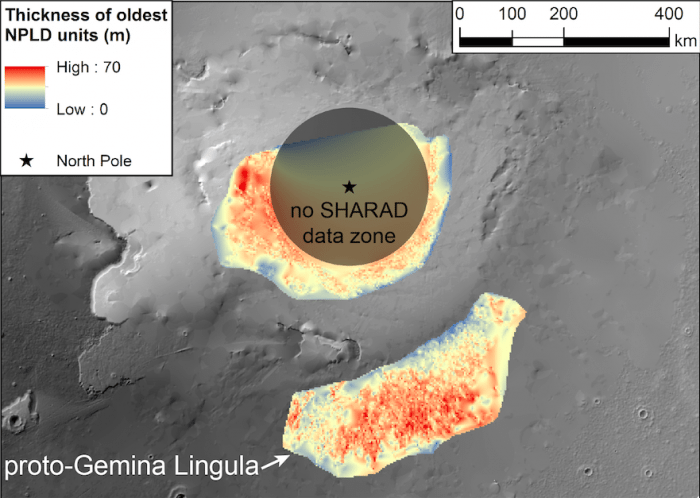 The oldest NPLD strata appear to have captured such variations in Mars’ orbital motions. These findings are described in the article entitled Earliest accumulation history of the north polar layered deposits, Mars from SHARAD, recently published in the journal Icarus. This work was conducted by Stefano Nerozzi and John W. Holt from The University of Texas at Austin. Stefano Nerozzi is a Ph.D. student at the University of Texas-Austin in the Jackson School of Geosciences. Stefano is interested in the evolution of the Planum Boreum of Mars as a record of past global climate. Investigations are based on orbital radar profiles and high-resolution imagery. More specifically, his current research focuses on the distribution and paleo topography of water ice deposits and their stratigraphic relationship with aeolian siliciclastic deposits.